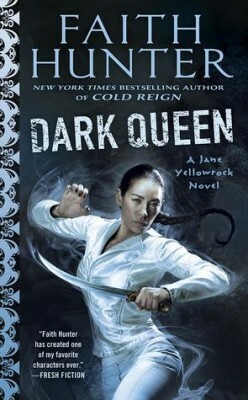 Details at the end of this post on how to enter to win a copy of Dark Queen. We also have a link to order it from Amazon, and an indie bookstore where a portion of the sale goes to help support KRL. In Faith Hunter’s latest, who is the Dark Queen? Jane Yellowrock. Jane is older than she looks, and far more dangerous. She was a child on the Trail of Tears, taught to kill, and made a shapeshifter by her Cherokee grandmother. Along the way, her soul got mixed up with a mountain lion, referred to as Beast, and she can change into battle-mode or full cat, with occasional dog-time (when an investigating nose is needed). She was a vampire hunter, but she now works for Leo, master vampire of New Orleans, eliminating rogue vamps who won’t play by the rules. For a whole lot of this twelve-book series, Leo has been waiting for a showdown with the European bloodsucker royalty, a battle to the death for control of America…and pay-per-view revenues. Now, the Eurovamps are officially arriving, and things are getting cray-zy. Jane is Leo’s Enforcer, in charge of security measures for the upcoming showdown, and some strange things are going on, like a witch entering the headquarters and not showing up on monitors, conspiracies upon conspiracies undermining the American leadership, and the ancient vamp hung on a wall in the fifth basement. Originally a loner, Jane has acquired a pseudo-family of mercenaries, witch-friends, hackers, and a vampire in her cellar. The group has grown so large and intertwined into the vampire society that they are granted clan status in a ceremony filled with pomp and silliness. On top of that, Jane discovers some long-lost family connections that leave her confused and uncertain. With all the preparations and politics, there doesn’t seem much room for action, but action there is. Fang fights, furry fracases, witchy warfare, time-tripping, and more! Hunter is a master of the game-changer and cliffhanger, and both are thrown into the mix to good effect. Characters are gone, characters will be added, and relationships will never be the same. To savor this series to best effect, start with Skinwalker, which began the saga, and look for the short-story compilations which fill in some gaps, explain relationships, and lead to other parts of the Faith Hunter world. In each chapter, look for the chapter title, a seeming non-sequitur, which will appear somewhere in the text. Happy hunting with Faith Hunter! To enter to win a copy of Dark Queen, simply email KRL at krlcontests@gmail[dot]com by replacing the [dot] with a period, and with the subject line “queen,” or comment on this article. A winner will be chosen June 16, 2018. U.S. residents only. If entering via email please include your mailing address (so if you win we can get the book sent right out to you), and if via comment please include your email address. You can read our privacy statement here if you like. Sweet! I’ve been excited for this to come out, but I’m re-reading the series right now for maximum effect. Looking forward to finding out about Jane’s family connections and how she finds out about them.